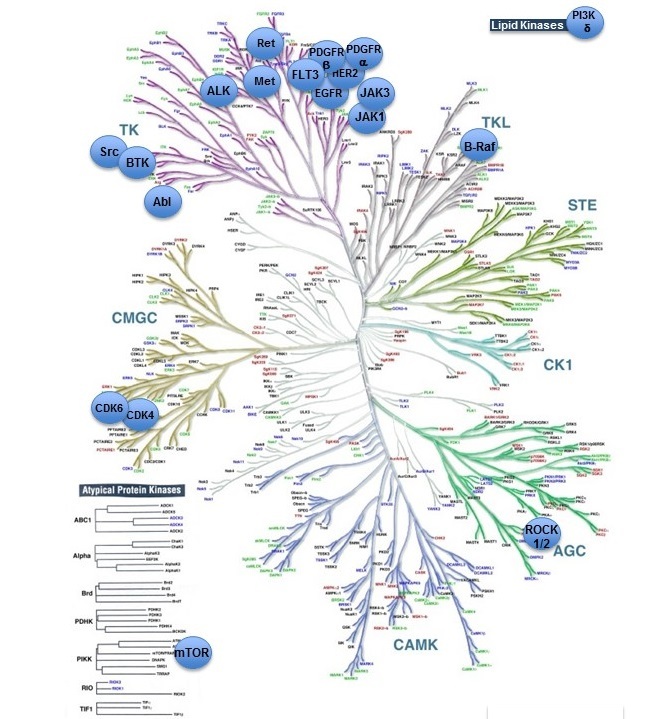 MAP kinases (CMGC kinases) may be divided into three major families: ERK, JNK and p38 MAP kinases. ERK may be activated by phosphorylation by the dual specificity mitogen-activated kinase kinases, MAP2K1 (Q02750, also known as MEK1) and MAP2K2 (P36507, also known as MEK2). The inhibitors PD98059 [1,3] and U0126 [4-5] act to inhibit these enzymes , and are used to inhibit ERK1 and ERK2. JNK may be activated by phosphorylation by the dual specificity mitogen-activated kinase kinases, MAP2K4 (P45985, also known as JNKK1) and MAP2K7 (O14733, also known as JNKK2) . p38 may be activated by phosphorylation by the dual specificity mitogen-activated kinase kinases, MAP2K3 (P46734, also known as MEK3) and MAP2K6 (P52564, also known as SAPKK3). Mitogen-activated protein kinases (MAP kinases). Accessed on 25/04/2019. IUPHAR/BPS Guide to PHARMACOLOGY, http://www.guidetopharmacology.org/GRAC/FamilyDisplayForward?familyId=288.